You are here: Home > myTouch 3G Going Free In Preparation For Slide Launch? myTouch 3G Going Free In Preparation For Slide Launch? With the myTouch Slide launch less than two weeks away, T-Mobile has gone and made the original myTouch 3G, the 3.5mm head jack edition available for the low price of…free! The original myTouch 3G, which as it turned out is the first in what is looking like a series of myTouch devices, launched to a whole lot of fanfare and a series of B-list celebrity commercials. Needless to say the device still remains one of the more popular T-Mobile Android phones and should make a nice companion to those people looking to jump on the Android train without any use for the latest and greatest. 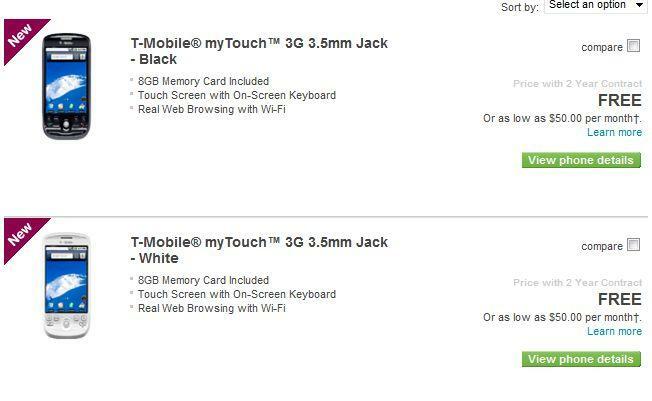 White and Black editions are both available from T-Mobile.com now and as far as we know this is an online only offer. A free Android phone? That’s a helluva deal there. Seen it coming but sounds great for those who wants to step up and away from a dum-err- “feature” phone to something with capable functionality with little to no cost. SAW it coming….whats up with ghetto people thinking SEEN is correct english? It’s a pretty simple verb. u feel better about yourself now? Wow??? You really felt the need to point that out. So, where is your apostrophe in “what’s”? “That Guy” is such a simpleton. Well he made a number of errors (e.g, those who “wants” to step up) and his tone/style is what some might call “net casual.” Not a serious violation compared to some moronic posts I see on the Net. Warning: The hazard to correcting people on these boards is that you then subject yourself to scrutiny. In other words, you cannot make mistakes. Correction of the words aside, why does the person that wrote that have to be described as ghetto. As most people are aware, the word ghetto, in America, normally is in reference to black people. So are you infering…”what’s up with black people thinking “seen” is correct english”? It’s starting to sound like you are “that guy”! Anyone know if they are going to offer this for existing customers upgrading their contracts? Well apparently (and to my surprise) the MyTouch Fender Edition still sells pretty well and above its expectations. I could imagine thats why it hasn’t come down on price. from what i’m hearing, Android 2.1 with Sense UI (espresso edition) Nis coming to the mytouch… atleast thats what i read. Oh.. I forgot the Fender Edition does have a 16GB card and not an 8… however I can get an 8GB sandisk at WalMart for $25. Just a small nitpick but that isn’t the original myTouch 3G, that’s the 1.2 version with the 3.5mm jack and the 32A rev. board. The original is the one without the jack and the 32B rev. board. I’m confused – isn’t the original MyTouch 3G the one with the USB headphone out and less RAM? Guys, really, the semantics of the original myTouch 3G model is irrelevant, strictly speaking the “3G” version as a whole, be it the one with the 3.5mm jack or the Fender edition all can be qualified as “original” models. The second set in the series, the Slide is that of a totally different design with different functions and features, far different than the mere upgrade differences between the first model run of the 3G and the second variant. David, any clues that the original mytouches will get 2.2 (sorry g1)! That’s great for anyone that wants a mytouch 3G. Any info on Project Emerald Tmonews? So, I am at the end of my contract and am using an older then dirt G1. Anyone have thoughts on what android device I should be on the look out for (carrier independent)? I am torn between getting a Nexus One at retail so as not to get a new contract, OR go to the dark side with Sprint. The MT3G seems like it will go the same way as the G1 and get stuck at some version of android and never be updated, so I don’t see why I should get it. I was going to go to Sprint, but they have too many complaints about customer service, so I canceled my order for two Evo phones, etc. If you stay with T-Mobile and want to stick with Android, I’d wait for the Samsung Galaxy S or even the Slide (if you want to keep using a physical keyboard). Note that going from a physical keyboard to touchscreen only typing is a BIG change, so you should keep that in mind (unless you did not use the G1 keyboard all that much). I’d pass on the myTouch. It’s too outdated in terms of what is coming to market. I suspect you would love the Slide since it has great specs compared to your G1. I’d also pass on the Nexus One, for reasons too numerous to go over here. Suffice it to say, IMHO the N1 was a big fail for Google and I suspect support for it will dry up by early next year. IF this is true, the nexus one was not a FAIL at all and that’s a big IF! Yeah, except that the N1 is a great phone, and by far the best T-Mo phone. Mine has been running 2.2(Froyo) for a couple of days now, which no owner of any other phone can say, or will be able to say, for a while. And since it is close to the cutting edge of current Android phones, and an excellent all around handset, there is no chance it will be rapidly left behind. Froyo is a solid upgrade, and the N1 will also be among the first to get Gingerbread whenever it comes around. Honestly Ben, the jump from the G1 to the Mytouch is not a big one. Mytouch is shinier and touch-screen only, but the difference ends about there. They both are ignored by TMo, but they both can be rooted and flashed with 2.1 from Cyanogen…personally, I’m waiting for that “HTC Twist” thingamajigger, from the Project Emerald rumor. Basically, this new offer is just to get rid of their Mytouch 3G stock to make room for the Slide. Also, it’s a great way to introduce Android to the feature-phone crowd that are hesitant to get into the smartphone market. SO if you want to pay higher monthly charges it’s a good deal. If you want a cheaper monthly rate plan then it’s not for you. So on an even more plus plan no deal for this offer of FREE. Good move I think. the phone is reaching the end of its life cycle – no longer close to being a leading-edge Android phone, but still a competent phone. Offering the device as a freebie might convince some fence-sitters to make the move to a true smartphone. It is currently running Android 1.6. However, it has been confirmed that the myTouch will be getting Android 2.1 with the Espresso Sense UI on top (like the Slide) in the coming months. The myTouch V1.2 is currently running Donut (Android 1.6). It comes with Swipe installed like the Fender version. free!!!! and now on to project emerald!!! Can anyone tell me when this phone will get the android 2.1 or 2.2 ? It’s a question of “if” not “when”. Confirmed to get the same 2.1 thats on the mytouch slide and since the mytouch slide will be coming out with 2.2 later on the mytouch could possibly get 2.2. Anything can happen but it’s getting 2.1 for sure. still retail price buddy… even more plus is a no contract meaning no discounts on handsets. you can get it by installments (20 monthly payments) if you’re an even more plus post paid customer though (meaning if you were approved for a 2 year contract (non-flexpay) and a discount on a phone but decided to go the ‘no contract’ route). This is one thing that annoys me about the cell phone market. Every other piece of electronics has a diminishing MSRP as the parks become less expensive as tech improves. Why do cell phones stay at the original MSRP (or close) until EOL? Look at the “retail” price of the cheapest phones Tmobile sells. I really wish phones would complete uncouple from contracts across the board. Then I could buy 1 year old phones for $150 less than launch every year instead of top of the line every two. The mytouch 3g is far from OVER. The specs are not that bad and can easily hold 2.1 (and maybe 2.2 too I don’t know). But maybe they are trying to get rid of all the 1.6 devices in preparation for the release of the rumored 2.1 upgrade with HTC Slide UI..
You could be right, especially since T-Mobile continues to sell the G1 as a premium handset. (T-Mobile sells it for $369 on Even More Plus). But then again, does anyone on the planet consider the G1 a hot phone? Nope, it needs a proper burial notwithstanding that it’s one of T-Mobile’s premium Android handsets. Perceptions aside, the main concern is whether or not a myTouch purchased today will continue to be upgradeable to later-released Android iterations. Will the myTouch go the way of the G1 in terms of not being upgradeable to the latest Android OS? Besides, it’s one thing to say that the latest OS will install, but how will it run. Will the myTouch be too underpowered to optimally run Android 2.2, for example? I mean the specs on the mytouch 1.2 is pretty much the same as Sprint HTC hero and it got 2.1 and is running it smoothly. The mytouch is far from being dated, the G1 on the other hand is slowly becoming a dated device everyday. I don’t know about 2.2 but I do believe the mytouch can run 2.1 very well..
I’ve been off-contract for about 6 months. When I look up the info for the MyTouch 3G, the price I get is $110. That’s not even for the 3.5mm jack version, which is $150. Along with the underpowered Cliq and Cliq XT. Is there a point to being “loyal” to a carrier? I get the impression that T-Mobile has no problem with customers leaving as long as they can add new customers with offers like this. Which I can sort of understand. Regardless of the MT3G comparing poorly to the Android smartphone competition, that’s a great offer for someone trying a smartphone for the first time or someone whose demands are not great. Who can easily be persuaded to take up a phone plan that costs more than their needs require. Still, when I can pick up (through Amazon or Wirefly) a Droid Incredible for $150 or a Droid for $20 (easily the best deal on the market for an Android), it just seems ridiculous to stay with TMO. Perhaps I’ll come back when, as a new customer, they’ll offer me a Project WHATEVER 4G for free. What I’m getting at: I just want to know aside from great customer service, why would you stay with TMO when you are given little reason to when it comes to upgrading? Whenever you come back for that Project Whatever 4G for free deal, you’ll probably notice at that time, they’re going at it in good ol’ TMo style, and it’ll already by a year or two out of date already… just look at the G1… no Free pricetag on that one yet. Did I miss something? When was it *confirmed* that MT3G will get 2.1 update with Sense? Why in the world “with Google” phone would get aftermarket UI? My G1 died recently and tmo replaced it under warranty with a mytouch… I was looking forward to getting the slide but now I can wait a little til I read some reviews. “Slider” UI is “Sense”, horribly modified by T-mobile. MT3G was originally released as a “With Google” phone, meaning stock Android, no OEM or carrier branding. Now, If I bought one and, all of a sudden, I was forced to use that ugly overlay with more bloat that Motoblur just to get my 2.1 update…well.. I would be very pissed. I’ve been running 2.1 (thanks to Cyanogen) on my phone and it runs wonderfully to say the least. I see no reason they would kill it if an aftermarket modder can make a 2.1 port fit on the device. the phones are not free. Has anyone successfully taken advantage of this deal? After I log in, I’m not able to find it. figure I’m going to have to call T-Mo to get it straightened out. Yeah dude I tryed to order it online but the order did not get placed, called the next day talked to a customer service rep and got it all straightned out! Looks like it was online as a one day sale only… Tmobile site shows the phones are back at $149 a piece today. Yesterday would have been a good day to jump on those, could have saved some good $$$. yea like other ppl are pointing out, it was a One day sale.. but wtf is it at a $149 price point? G1 should be free now (even tho they only have a white one online), mT-3G should be $49 ($79-99 for LE).. u guys should know the rest. The words “FREE” and “With a 2 year contract” are MUTUALLY EXCLUSIVE. There is NOTHING FREE ABOUT IT!!! When does this end? I looked on the website today and there not free anymore.